Wall Street may be the biggest auction on the planet. But when it comes to assets instead of equities, wholesale auto auctions are America's largest trillion dollar free market. You can buy anything. Really. Over 10 million vehicles are liquidated every year. Everything from an off-lease Bentley, to a 25 year old rolling turd that's worth more dead than alive can be had with just a wink and a big enough checkbook. Every car at an auto auction is there for a reason, and as a long-time car buyer, it's always been up to me to me to find out that reason. Some people just get bored of their daily driver. Others had an owner who was the vehicular version of Jack Kevorkian. There is a lot of neglect and abuse that takes place and, here's a little surprise for you. It's usually not the prior owner's fault. Manufacturers these days are forced to compete within a very narrow price level to move their metal. The by-product of this is that there are a lot of under-engineered vehicles that wind up kicking a proverbial money bucket or two after the warranty runs out. It's a grey area of the marketplace where you, the owner, is usually stuck with a defect that the manufacturer doesn't want to recall, ever. Oh, and before you folks get on that anti-GM bandwagon, let me fill you in on a little secret that I've learned over the course of 15 years. They all do it. Every... single... manufacturer,..
One manufacturer's ignition switch is another's piece-of-excrement transmission, which is another manufacturer's lifetime fluid that either eats up the intake manifold gasket, or blows your torque converter into kingdom come. There are literally thousands of shortcuts and dumbopf bean counter decisions that will give you anything from a check engine light, to a repair that is bigger than your savings account. So today I'm going to give you a very short list. Here's five steadfast rules that I find as common at the auctions as angry talk show personalities on a Monday afternoon. 1) Most Honda Accords Have Bad Transmissions. Specifically, those Accords that were built between 1998 and 2002. Honda has a long-standing tradition of building transmissions for six-cylinder models that simply don't last. The Honda Odyssey along with the Acura CL & TL were all victims of it during that time period, but for the last several years, I have been seeing more than my share of four-cylinder models with automatics turn into stationary paperweights. 2) At Chrysler, The Mark Of The Devil Is 2.7. Not 666. The Chrysler 2.7 Liter engine is quite possibly the worst American engine of the last 20 years when it comes to longevity. This God forsaken engine was put into millions of midsize and compact Chryslers, and they all eventually develop engine sludge with the size and consistency of winter snow in Buffalo. Here's a personal example. I once bought a Chrysler Concorde that was owned by the Salvation Army since day one. No joke. Oil changes every 3k. An interior clean enough to sleep in. It was only 5 years old... and it didn't matter in the end. Six months after I sold it, the head gasket blew like Mt. Saint Helens. 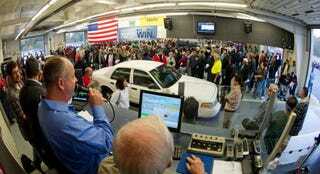 Since then thousands of Chryslers have found their way to "wholesale heaven". A place where crappy old cars are left at the auction because no retail customer in their right mind would ever want them. I'm not talking about the old rear-wheel-drive Volvos of the 80's thru mid 90's that came with the uber-reliable red brick engine. I'm not even talking about the old SA... wait... I am definitely talking about old SAABs, and the not so new ones too. Volvo customers were fooled into believing that lifetime transmission fluids meant the actual lifetime of the vehicle. No! Nein! Nyet! It was the lifetime of Volvo's warranty, and within 10 years, most of those transmissions wound up on the crazy train of perpetual dealer service. Beyond the torture of seeing newer Volvos molderizing in the showrooms, Volvo's clientele were forced to try several hundred dollar band-aids on a gangrene defect that would eventually cost thousands of dollars on top of all the sensors... and modules... and software updates... and about fifteen other things. "This car is going to last me 20 years." As for SAABS... older ones are the automotive version of leprosy. There is nothing harder to sell or fix than an old SAAB. This is why a based-out 2003 Corolla will usually cost more to buy at the auctions than a loaded 2007 SAAB. Over time, quality always has a way of outing itself. I always check the histories of Nissans that were given CVT transmissions during the mid-2000s. If they weren't replaced, I won't buy them. Price be damned. The same is true for the Ford Freestyle, Saturn VUE, and Dodge Caliber. The long and short of it is that if that well used CVT doesn't come loaded with planetary gears, such as that in the Toyota Prius, I won't look at it if it has higher miles. You just have to own at least one of those two dealerships. A recent long-term reliability study that I co-developed now has nearly 600,000 data points from all over the United States. What we discovered is that the chances of having one of these models be a reliable long-term companion past 180,000 miles ranges between over 40:1 for either brand, to over 1700:1 if you must make the neighbors believe you appreciate all things Brtiain.